On Monday, BlackBerry(s bbry) suggested that it was open to various options in order to keep the company moving forward. Those options include, but aren’t limited to, a sale, a joint venture, a strategic partnership or any other feasible plan to help the once mighty smartphone leader. It’s too bad we’re in 2013 because an interesting plan — along with a billion dollars in commitments — were poised for a BlackBerry takeover in 2012. Over a year ago, I helped form a secret product and engineering team based Silicon Valley that was keenly interested in taking over the company. We wanted to move the company and its passionate customers to a custom enterprise tier of Android. We saw a troubled company that could be saved. 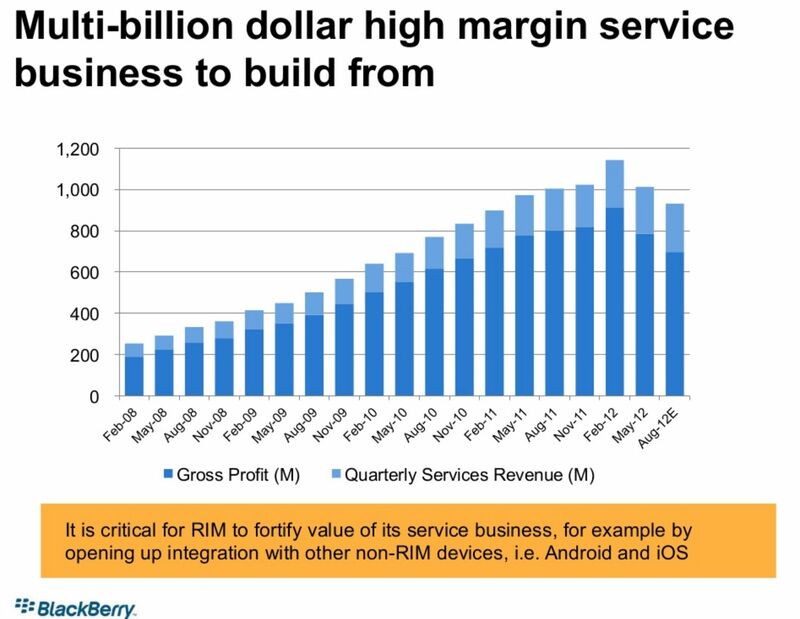 Interestingly, part of the plan Chan shares mirrors the expectation I presented in a 2012 prediction post: Namely, that BlackBerry ceases to make hardware and focuses on services. I never suggested that BlackBerry use Android(s goog) but Project BBX relied in part on Android and pushing BlackBerry services and security in the enterprise with the devices. The plan is likened to IBM’s(s ibm) comeback when it left the PC business and focused instead on services. For Project BBX, hardware would always be secondary. Ironically, it suggested a small keyboarded phone and a larger full-screen device; exactly what BlackBerry has on the market today with its Q10 and Z10. Tablets were a long-shot in the plan and sound similar to what BlackBerry offered in the Playbook: a device that tethers to a BlackBerry phone for its secure connection. We know now that Project BBX wasn’t successful. BlackBerry itself, however, is still a project that’s very much in progress. It’s a question of what plan is the right one for the company as its competitors continue to distance themselves by moving forward as BlackBerry tries to find its way. I said last year that Apple will buy BlackBerry and the current positions of both companies only strengthens my view. Imagine BES + iOS7 + iPhone 6! Apple would gain service revenues from 70m+ subs, a true Enterprise-grade email product, it’d make corporate IT departments trying to secure BYOD strategies happy, make corporate iOS device users happy, and would give Apple a really strong differentiator against Samsung/Android handset makers, as well as a really compelling cross mobile device strategy. It could also, over time, convert BlackBerry users to the Apple ecosystem. Why would the move to an Enterprise Tier of Android? There is something very bad happening here. All mobile OSes that are not utter crap (like Android) are driven into the ground. Palm webOS was a really neat OS from a technical point of view. HP ruined it. Why didn’t Nokia or someone else fighting with Android build high quality hardware and put commitment behind the eco-system (-> bring third party developers in == win). Now BlackBerry OS 10, which is *awesome* compared to Android. This is just sad. This way the only real competitor iOS will have for a long time will be Windows Phone OS. Android is utter crap? Sorry, I didn’t read the rest of your comment as I assumed it was as ill-informed as your opening paragraph.